The Swedish Pimple is a superb jigging lure. 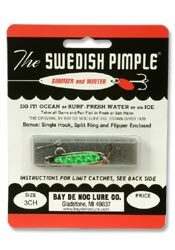 This type of lure has been widely used in Sweden for over 100 years with exceptional results on both fresh and salt-water fish. Jig it, summer or winter! Their proven ability to take walleye, trout, Coho salmon, northern, bass, pan fish and many salt water species makes owning this lure a must for most all larger sizes are for game fish in deep water lakes. The company has expanded with new lure designs and flashy patterns. Not only Swedish Pimple* , Swedish Pimple Crushed Ice, Hammered we also have Flute Spoon, Do-Jigger*, Vingla*, Laker Taker and Flutter Laker Taker. We are proud of our fishing lures and believe in the craftsmanship that we put into each and every one.